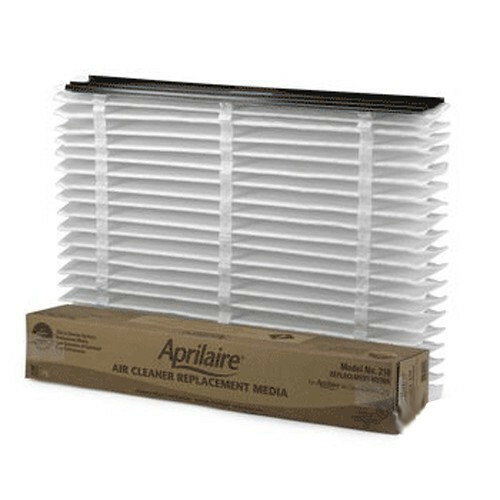 Aprilaire 213 Replacement Filter Media - 21 1/4" x 25 1/4" x 4 1/4". Brand New Genuine Aprilaire Product. Dimensions: 21 1/4" x 25 1/4" x 4 1/4"
This filter needs to be changed every 6-12 months depending on your home's indoor air quality. If you have an Aprilaire 3210 air purifier, your event-based control will indicate when it is time to change your filter. This new style filter media DOES NOT require the use of pleat spacers. The Aprilaire 2200 and 2120 air cleaners require the Aprilaire 1213 Upgrade Kit (which includes a metal frame & a 213 filter). You must purchase this kit in order to install the filter. Click Here for the Aprilaire 1213 Combo Kit. The Aprilaire 213 replacement filter provides MERV 13 particulate filtration performance without the need for installing pleat spacers like the old Space-Gard 201/401 media. The Aprilaire 213 filter simply pops up to the proper size and slides directly into several models of the Aprilaire filter cabinets. Been using these filters for 3 years now,they do a great job. Quick and easy changing. Name brand filter at the lowest price! I am so glad I found this site. I was paying twice their listed price when I had to get them from my HVAC dealer. After paying about $10,000 for a new heat and air unit, I thought I would be okay for a while and not have to spend a lot of money just for filter maintenance. I change my filter twice a year and like paying the lowest price I can find. I also use one of those really cheap filters (the kind you can see through) in my 2 return vents, and change them monthly. It helps my more expensive filters last longer, and was recommended by my HVAC installer. You're reviewing: Aprilaire 213 Filter Replacement - 21 1/4" x 25 1/4" x 4 1/4"